If you have been injured in a car accident, it is important to have an experienced personal injury lawyer standing up for your rights. 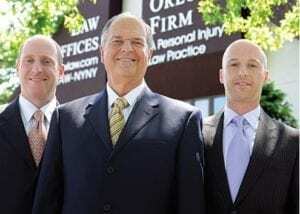 At The Orlow Firm, we have extensive experience handling car accident insurance claims for clients in the Bronx. We will handle all of the legal details, so you can concentrate on recovering from your injuries. Contact our Bronx law firm today to speak with an experienced Bronx car accident insurance claim attorney. If you have been injured in a car accident, you may find yourself in an adversarial position against the other driver’s insurance company as well as your own. Insurance companies prosper by denying and delaying claims. Therefore, it is important to have an experienced personal injury attorney who will stand up for your rights. Our lawyers have the skill and experience to handle complex car accident claims, including those involving uninsured/underinsured motorist coverage, multiple defendants and other issues. We urge you to speak with your own attorney before making any statement to the insurance company. They may use your words against you, to limit or deny your compensation. You have 30 days to file a no-fault insurance claim in New York. If you miss that 30 day mark, you may have given up your chance to recover compensation for medical bills, wage loss and other hardships you face as a result of your accident. An experienced personal injury lawyer knows the deadlines and will not let you miss them. Our attorneys will guide you through every stage of the process and handle your legal matters with the utmost care and attention to detail. If you have missed a deadline, the experienced attorney may be able to help you overcome that error. Have you or a loved one suffered a serious injury in a car accident? If so, contact our New York car accident lawyers today for information regarding your legal rights.